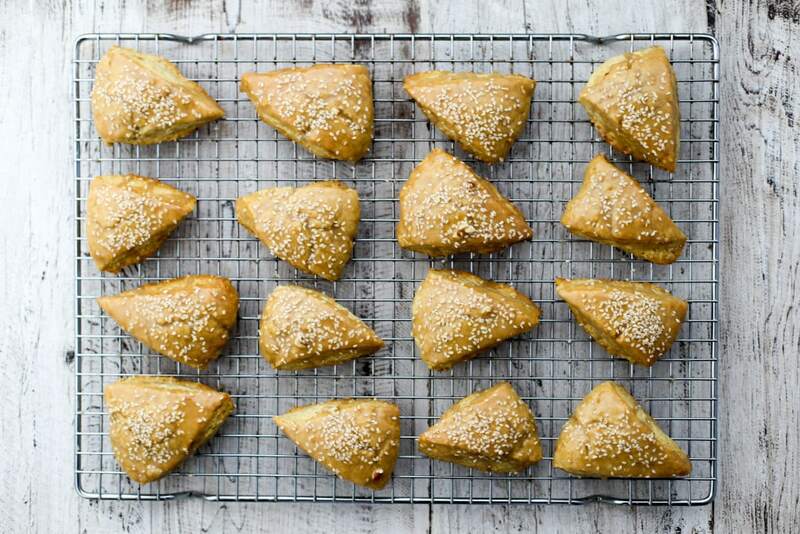 These fluffy, flaky scones are so, so good. I had so much fun being the “treat fairy” at work this week, and the whole office really enjoyed them! 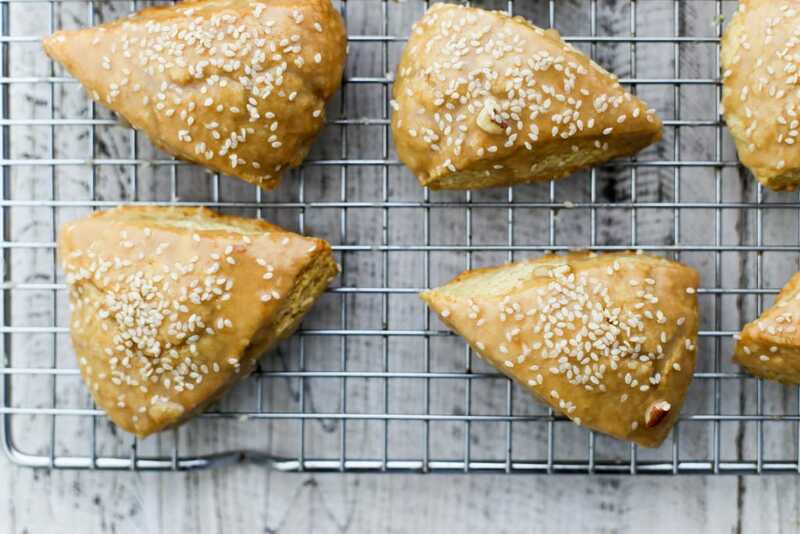 The unusual combination of sesame and coconut works surprisingly well, and the not-too-sweet dough is complemented by a sugary layer of sesame glaze. 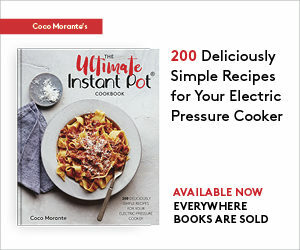 In my recipe developing career, I’ve come up with a few base recipes that I end up going back to again and again, making variations on a theme. These scones fall into that category for sure! I’ve done Pear Scones with Chai Tea Glaze, Pumpkin Scones with Maple Spice Glaze, Coconut Scones with Ginger Glaze . . . my friend Cheryl has even put her own spin on them, featuring a recipe for Green Apple Scones with Cider Glaze in her latest cookbook. Today’s variation contains a couple of unusual ingredients, and due to some clever substitutions, it’s entirely dairy free. There’s a strong whiff of coconut to the dough, due to coconut oil and coconut cream taking the place of the dairy ingredients in traditional scones. 1.) Be sure to chill the dough properly before baking. Give it a good hour in the fridge to firm up, so you’ll be able to cut it into sharp wedges that’ll rise impressively in the oven. While you’re at it, don’t touch the cut sides of the dough as you’re moving each scone to the pan, and get them into the hot oven as soon as possible after slicing. 2.) Take care when dunking the scones into the glaze. You’ll want to do it while they’re pretty hot, so the glaze can melt over the scones and settle in a bit. The scones are very, very tender though, so this takes a delicate hand to avoid breaking them as you dip. It can help to use a serving spoon to maneuver them out of the bowl of glaze. 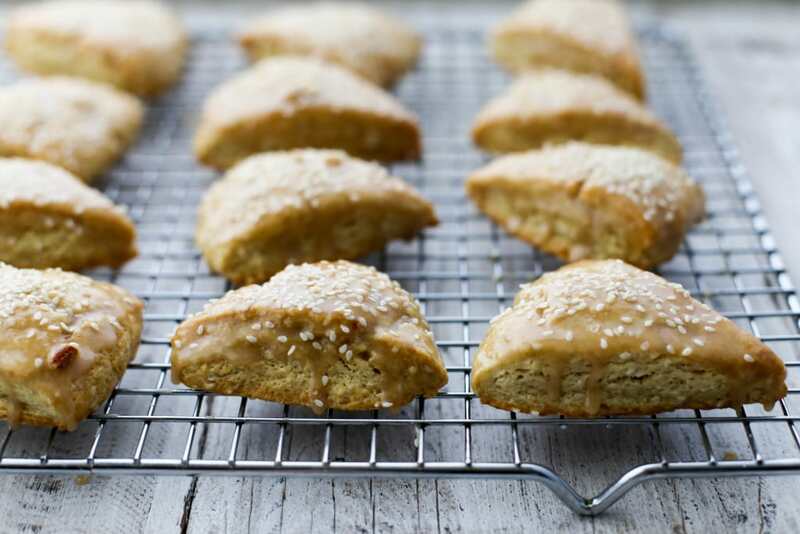 Oh, and sprinkle those sesame seeds on top while the glaze is still warm so they’ll stick nicely! For my glaze, I used an ingredient I was sent for review: Bonelli Simply Sesame. 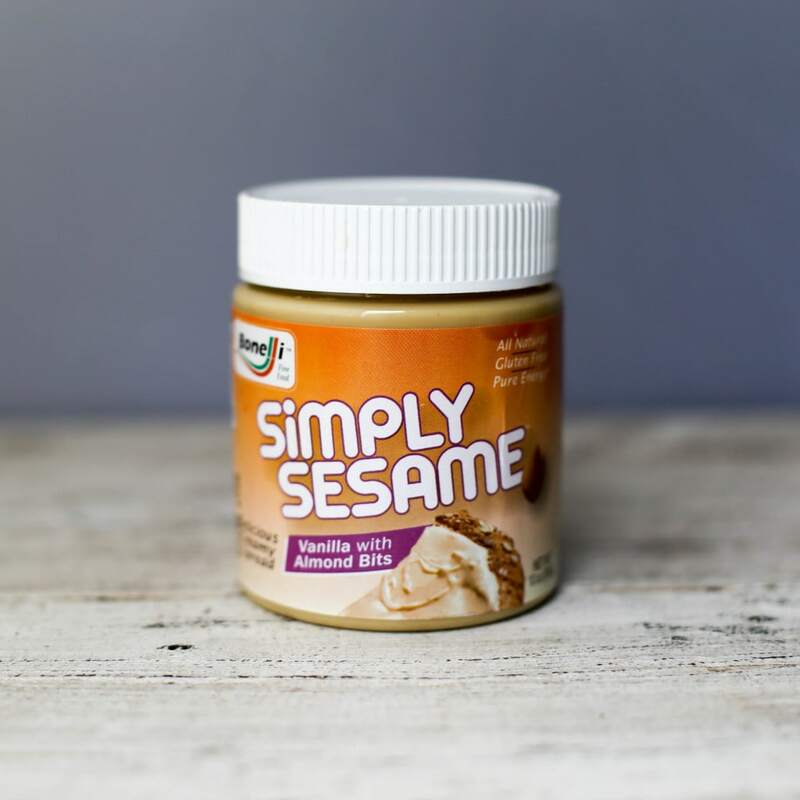 It’s a sweetened sesame paste, and it’s quite versatile! 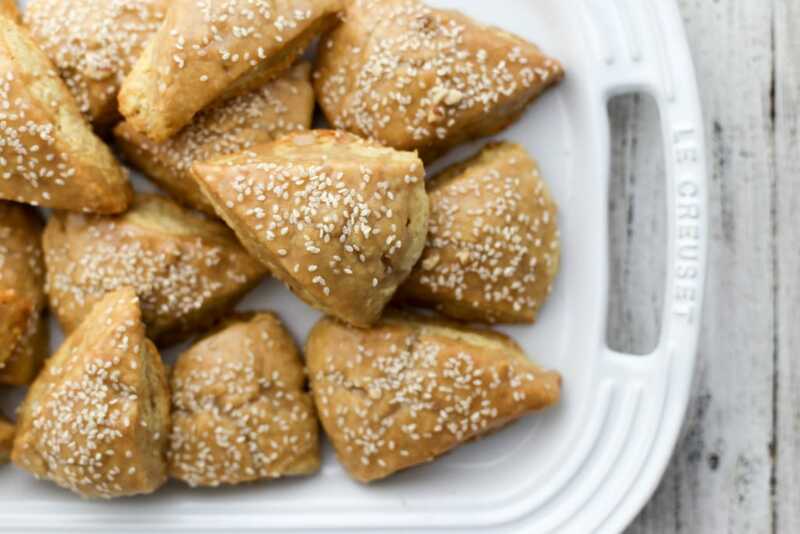 I’ve used it as a dip for apples and pears, drizzled it on Greek yogurt and oatmeal, and of course, mixed it up with a couple other ingredients to glaze these scones. It comes in a variety of flavors, and I used the Vanilla with Almond Bits version here. You can find them on facebook, twitter, and instagram. I recommend serving these with black tea or coffee for an afternoon treat. Enjoy! 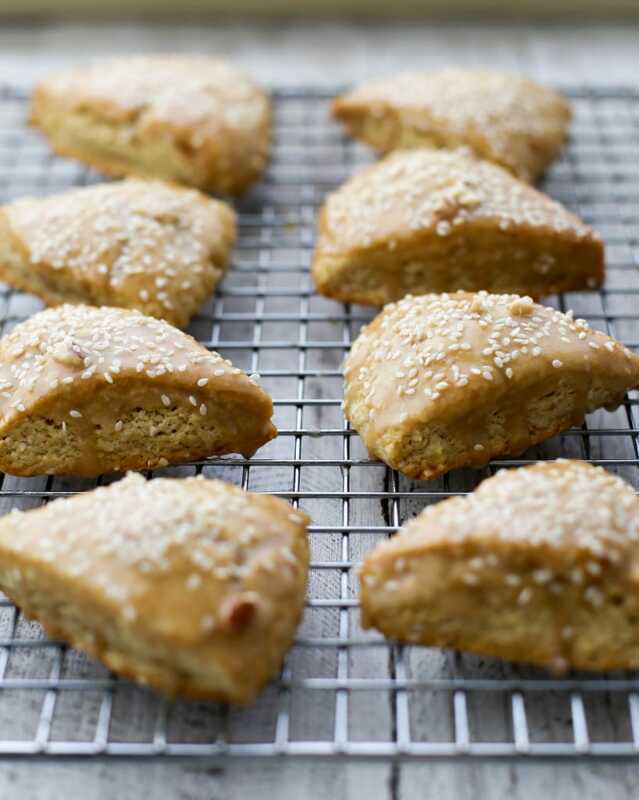 Flaky, fluffy, not-too-sweet scones that are dairy free, a.k.a. pareve. Enjoy them with an afternoon cup of tea. Measure the flour, brown sugar, baking powder, baking soda, salt, and sesame seeds into a medium mixing bowl. Add the coconut oil to the dry ingredients, using a pastry cutter to incorporate the coconut oil into the flour. There should still be a few pea-sized pieces of coconut oil throughout. Make a well in the center of the bowl, and set aside. In a small mixing bowl, use a whisk together the coconut cream and egg until no streaks of egg yolk remain. Pour this mixture into the well in the bowl of dry ingredients. Use a wooden spoon or dough whisk to the wet and dry ingredients, just until all of the flour is absorbed and the dough begins to come away from the sides of the bowl. Divide the dough evenly in half, then pat/shape it into two disks, 1/2-inch thick and six inches in diameter. Wrap the disks of dough with plastic wrap and refrigerate for at least 1 hour. Line a baking sheet with a silicone baking mat or parchment paper and preheat the oven to 350°F. Remove the dough from refrigerator, then cut the disk(s) of dough into eight wedges. Place them 1 inch apart on the lined baking sheet, being careful not to touch the cut sides of the scones as you move them. Bake scones for 15-18 minutes, until lightly browned. While the scones are baking, whisk together the glaze ingredients in a small bowl. 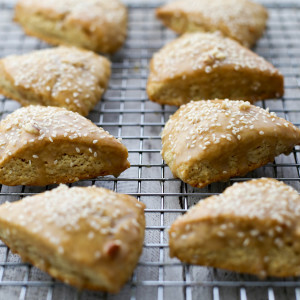 While the scones are still warm, dunk their tops into the glaze, then set them on a cooling rack. 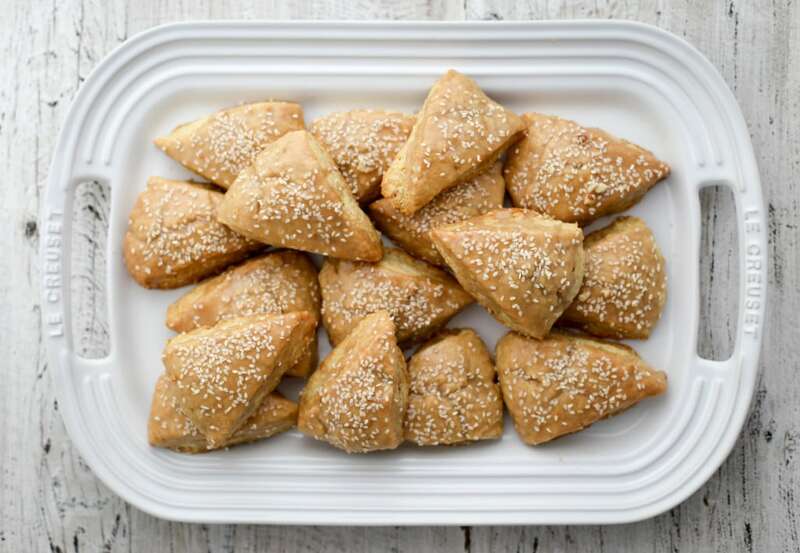 Sprinkle with sesame seeds and let cool until the glaze has set. Coconut cream is a canned, unsweetened product made of shredded coconut and water. It is basically a thicker, richer version of coconut milk. 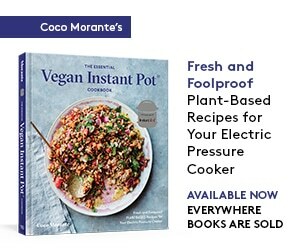 I buy mine from Trader Joe's, and it is also available on Amazon (this is an affiliate link).